I have published my photo of the Giant Squid Nebula. Au4, earlier at November 28. I made a new composition out of the same material, it's little more dynamic now, I think. 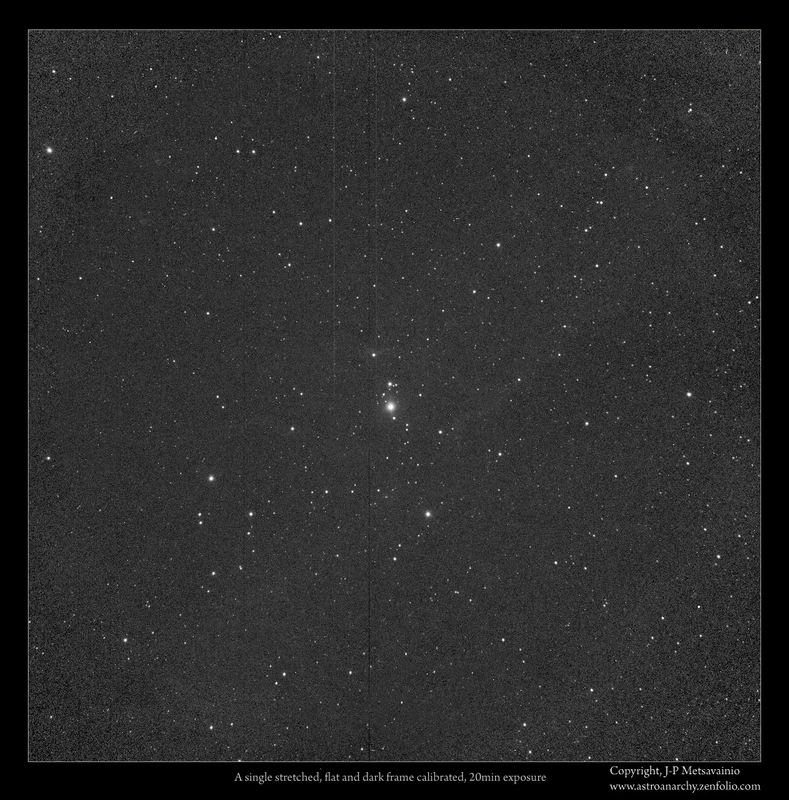 I started this imaging project at this autumn season and after a several months I got it ready! The Celestron Edge 11" telescope with a 0.7 focal reducer has a perfect field of view for this object. This combo delivers a very high quality image from edge to edge. 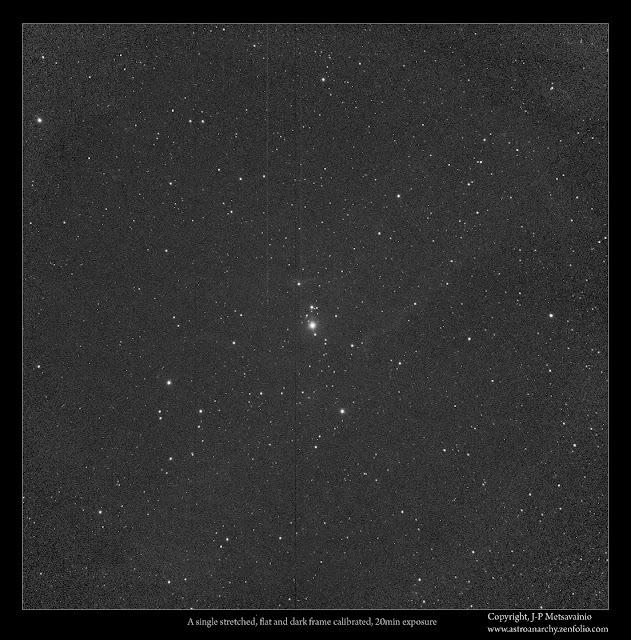 The Apogee U16 can be very challenging to have a good orthogonality and collimation due to very large CCD-shell. Natural color scheme from the emission of an ionized elements, H-a, S-II and O-III. 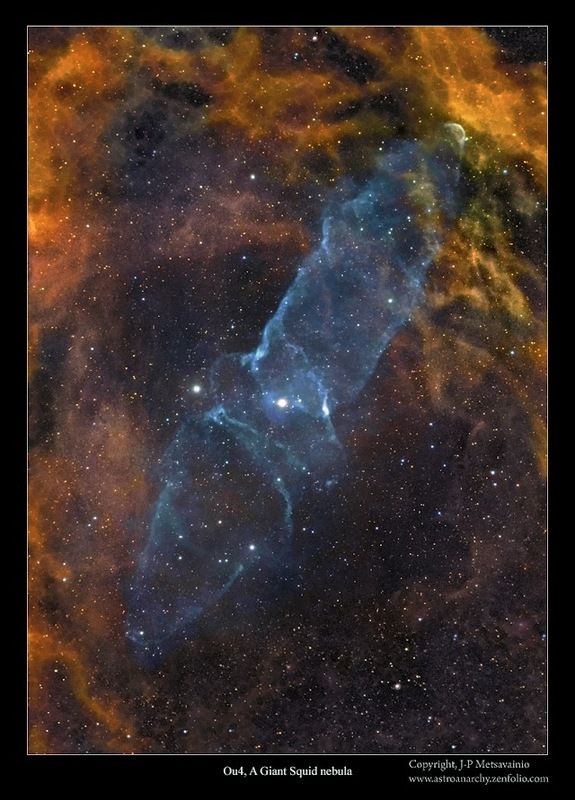 This is a very large nebula, this image spans vertically about 1.5 degrees = three full Moons side by side in a sky. 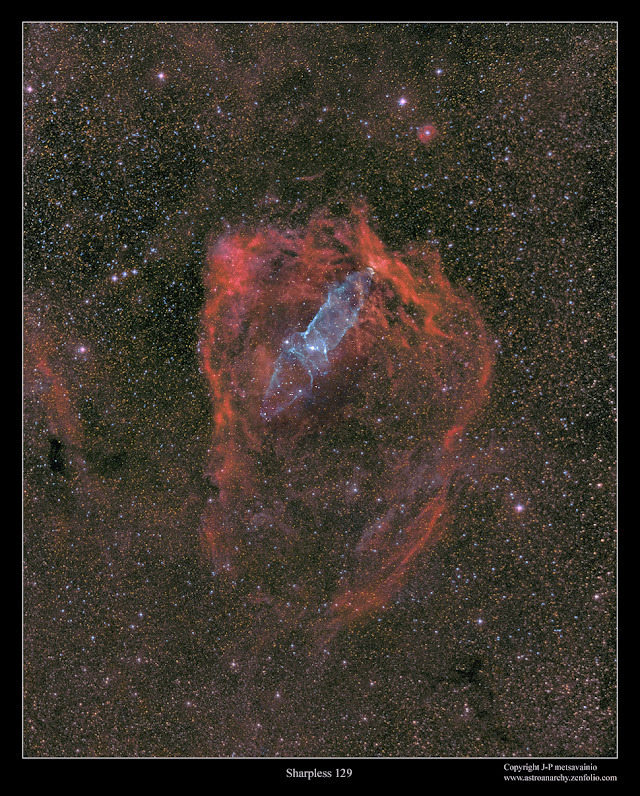 An older photo of Sharpless 129 is combined with a new data. Image is in natural color palette. 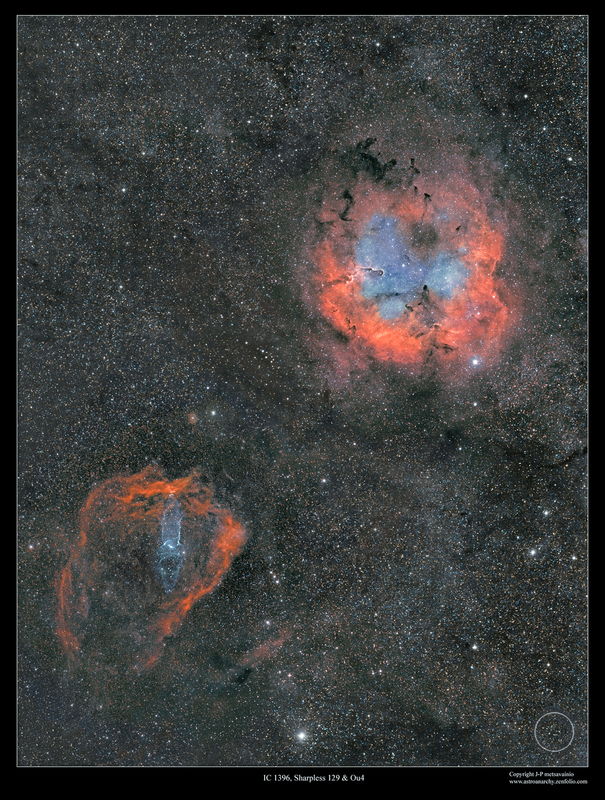 This photo of Sharpless 129 was taken with Tokina AT-X 300mm f2.8 camera optics, QHY9 astrocam and the Baader narrowband filter set, H-alpha, S-II and O-III. Note, there is a white circle at lower right corner showing an apparent size of the full moon at same scale. (Moon has an angular diameter of 0,5 degrees.) Ou4 and companions are very large objects! This is a four panel mosaic image of constellation kepheus, taken with Canon EF 200mm f1.8 camera optics, QHY9 astronomical camera and the Baader narrowband filter set, H-alpha, S-II and O-III. Image is in mapped colours, from the emission of ionized elements, R=Sulphur, G=Hydrogen and B=Oxygen. The giant Squid Nebula cataloged as Ou4. Nebula was discovered in 2011 by French astro-imager Nicolas Outters, the Squid Nebula's alluring bipolar shape is distinguished here by the telltale blue-green emission from doubly ionized oxygen atoms. 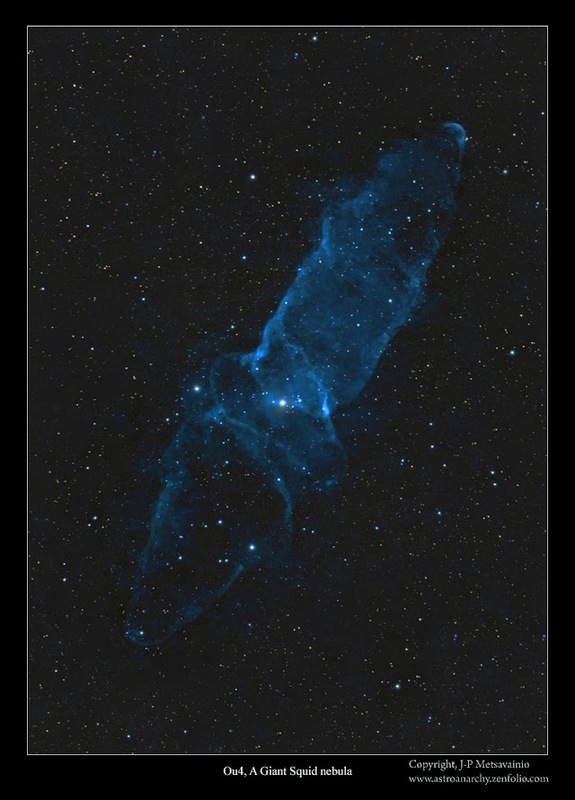 The true distance and nature of the Squid Nebula have been difficult to determine. 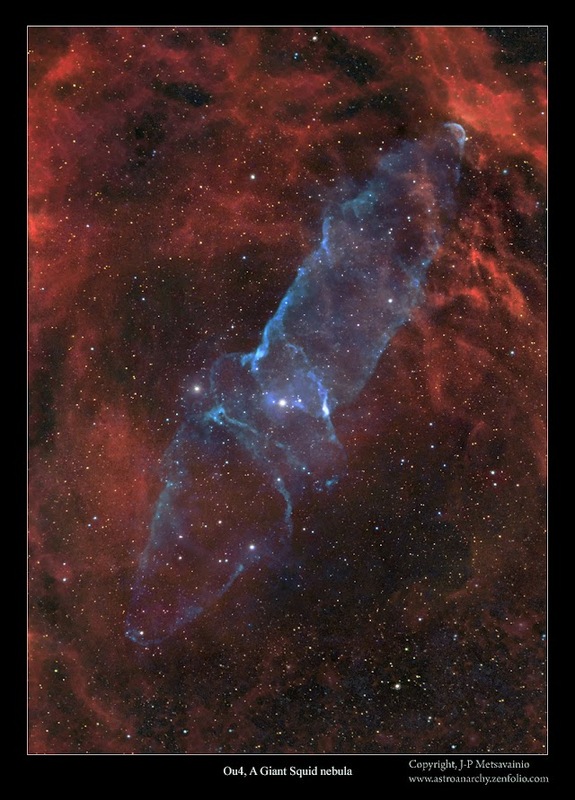 Still, a recent investigation suggests Ou4 really does lie within Sh2-129 some 2,300 light-years away. Consistent with that scenario, Ou4 would represent a spectacular outflow driven by HR8119, a triple system of hot, massive stars seen near the center of the nebula. The truly giant Squid Nebula would physically be nearly 50 light-years across. O-III, 105 x 1200 s, binned 4x4 = 35 h.